Antoine-Marie-Chamans de Lavalette joined the French Revolutionary army in 1792. After the Battle of Arcole he became aide-de-camp of Napoleon in 1796. Napoleon was favourably impressed with him and sent him on diplomatic missions. He married Émilie-Louise, a niece of Joséphine de Beauharnais. During the Empire he was Minister of Posts and in 1808 Napoleon made him a Count of the Empire. After the fall of the Empire he refused to go in exile with Napoleon because his wife was pregnant and he had a thirteen year old daughter. His wife lost the child and he was sentenced to death on November 21th, 1815. The night before his execution he was visited by his wife and his daughter. They changed clothes and he escaped, wearing his wife's dark veil. He fled to England and then to Bavaria, where he was supported by Eugène de Beauharnais. His wife was imprisoned until January, 1816. Her emotions had damaged her sanity and she was put in a mental institution. In 1822 he was pardoned, returned to France and picked her up. He died in 1830. 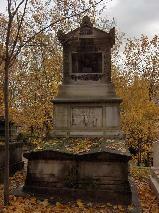 The grave of Antoine-Marie, comte de Lavalette at Père Lachaise, Paris.